At 777 Casino, you can get your hands on a great bonus. 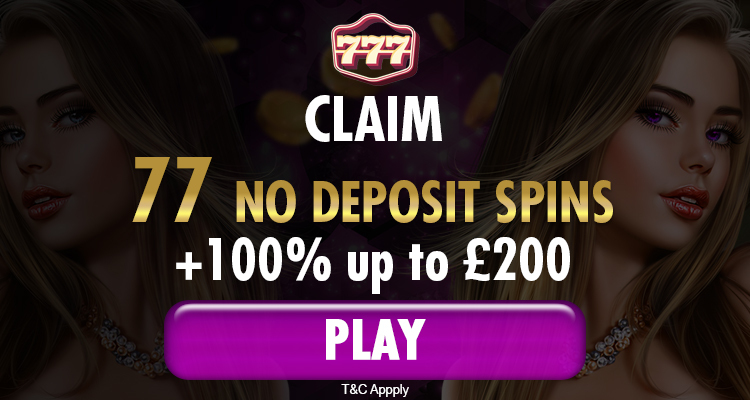 You can receive 77 no deposit spins on registration. Use them to play Jacks Pot, Treasure Fair, Steampunk Nation, and The Big Lebowski. You can’t withdraw more than £20 from this offer. If you want more, you should deposit at least 20 Pounds with the code WELCOME77. You will receive a 100% bonus up to £200. Have tons of fun with the additional money! Withdraw your winnings only after you’ve wagered the bonus 30 times. Don’t waste any minute and claim this offer now!